LAMBDA CHAIN LIGHT MULTIPLE MYELOMa (MM), ASSOCIATED TO BONE PLASMOCYTOMA (BP). EVOLUTION FROM BP TO MM. 1Mechán Méndez Víctor, 2 Chipana Sotomayor Marco, 3Aguilar Herrera Segundo 4Alfaro Lozano Alejandro, 5 Mechan Escalante Daysy. 1. Servicio de Hematología, Hospital Nacional Dos de Mayo (HNDM). Lima, Perú. Profesor principal de Medicina de la Universidad Nacional Mayor de San Marcos. 2. Servicio de Neurocirugía, HNDM. Lima, Perú. 3. Servicio de Medicina. Sala Santa Ana. HNDM. Lima, Perú. 4. Departamento de Anatomía Patológica. HNDM. Lima, Perú. 5. Interna de Medicina Humana. Universidad Privada Antenor Orrego. Trujillo, Perú. Summary. 55 year old woman with back pain and difficulty walking for 1 1/2 year. In the last 4 months she added hiporexia, lumbar pain and immobility of lower limbs. Admitted to a General Hospital (2009), she received treatment for tuberculosis: 2HRZE/4H2R2 (INH, RFP, PZN and ETH), having been detected M tuberculosis in a smear of urinary sediment. 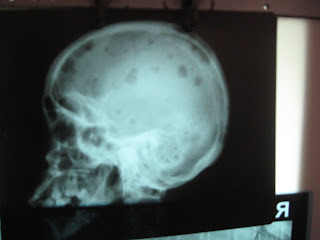 Before ineffectiveness of treatment she was taken to the General Hospital Dos de Mayo (HNDM), in 2010, where Magnetic Resonance (MR), showed partial collapse of L3 vertebral body, cranial tumor in right parietal area (lambda light chain BP) and systemic circular bone injuries (coin lesions) on chest, ribs, scapula, humerus and both femurs. Protein electrophoresis in serum and urine of 24 hours, showed absence and presence of monoclonal spike, respectively. Bone marrow biopsy showed general cell hypoplasia and range of neoplastic plasma cells :3-6%. Urine RBC: 18-20 per field, agglutinated leukocytes, hyaline and granular casts. Urea: 108 mg/dl. Creatinine: 3.6 mg / dl. 30/6/2010: The patient develops urinary tract infection, hypercalcemia and renal failure, dying without treatment. Keywords: Lambda light chain Multiple Myeloma, lambda light chain cranial bone plasmacytoma, solitary bone plasmacytoma, vertebral-lumbar-plasmacytoma, radiological coin lesions.